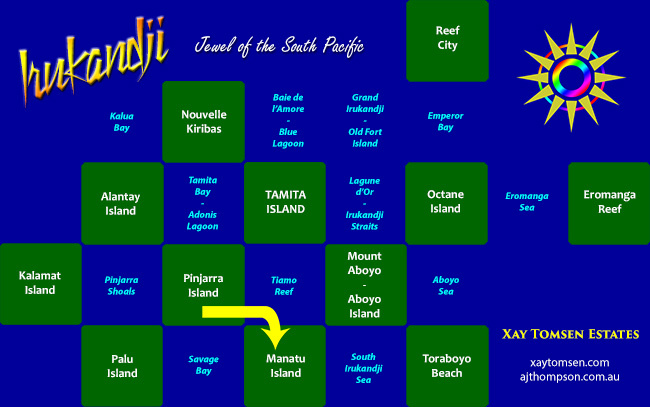 NOTE: This page is about Manatu Island in InWorldz. 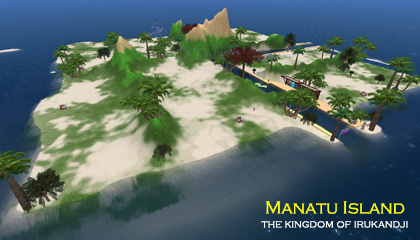 The Second Life version is here: Manatu Island in Second Life. 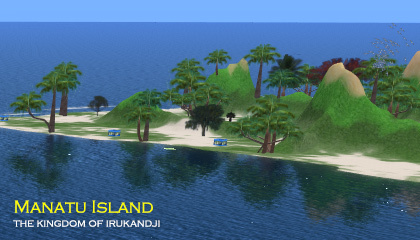 Manatu Island is a residential island on the InWorldz virtual world grid, located in the south of the Kingdom of Irukandji. Manatu Island in IW faithfully follows the legend and myth of the previous version in Second Life, and again like its predecessor, it is a residential island. I used the terrain file of the original version as a template for the new Manatu Island but I did change the landscape significantly over coming months in order to match up the coastlines with adjoining sims. The Aboyo River ran through Manatu Island from Tiamo Reef in the north to Savage Bay in the west, and an underwater section of the Inter Island Causeway stretched east beneath South Irukandji Sea to Toraboyo Beach. The island was well-supported by tenants during its eighteen months on the InWorldz grid. Neighbouring regions, clockwise from west, were Savage Bay, Pinjarra Island, Tiamo Reef, Mount Aboyo (later Aboyo Island), and South Irukandji Sea. Below are a few photographs of Manatu Island that I took during my travels.